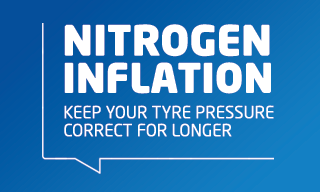 Filling your tyres with nitrogen instead of compressed air means that your tyre pressure will remain at the appropriate threshold for longer because the rate at which nitrogen passes through tyre walls is slower than oxygen. At ATS Euromaster, the equipment we use completely removes the current gas in your tyres (deflates them) and re-fills them using nitrogen that has been taken from the air and purified. This is done on all 4 tyres at the same time and takes a matter of minutes. Get a clearer idea of your tyre’s pressures by keeping your TPMS in working order. Find out more about TPMS services at ATS Euromaster. Why put nitrogen in tyres? You should check your tyre pressure regularly as this allows your tyres to grip the road as they should. Incorrect tyre pressures can cause unnecessary wear, meaning your tyres could wear unevenly and may lead to premature replacement. Low tyre pressures mean that your tyres create more resistance to movement, which takes more energy to move your car. This means that your car uses more energy to roll, making the engine work harder and using more fuel in the process. As well as using more fuel, the extra effort that your engine has to go to means an increase in the CO2 emissions your vehicle produces. The performance of your tyres will be affected too, with grip, stopping distances and wet weather performance all being influenced by the correct pressures. Once you have nitrogen in your tyres, ideally you should keep the pressure topped up using nitrogen to a minimum of 95% to feel its continued benefits. If you need to top up using compressed air, this is fine but it will dilute the nitrogen content in the tyres. You know you should check your tyre pressure regularly, but why? Please note that the price stated for Nitrogen Inflation applies per tyre.